Lafayette Ave. and Marcy Ave. 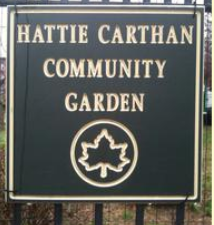 The Hattie Carthan Community Garden, located at Lafayette and Marcy Avenue, was formed in 1991 as a place where humans can expand their knowledge of plants and grow fresh food in Brooklyn. The garden has been a public space that is multigenerational and multicultural for over two decades in Bed Stuy, Brooklyn. The garden is named after a prominent Brooklyn environmentalist who was instrumental in planting over 1,500 trees in Brooklyn. In the mid-90s the garden received preserved landmark status as a result of the community's organizing efforts and became an Operation Greenthumb Parks & Recreation site. The Hattie Carthan Garden is an important public space with its own legacy and history. The garden is equipped with a recently built children's learning garden, mushroom patches, new chicken coops, a three bin composting system and vermicomposting system. There are currently 60 members on the books, 45 individual plots, a large herb garden, a host of flower beds and islands, and fruit trees (fig, peach, apple, plum, sour cherry and apricot). Two thirds of the garden is dedicated to food production. In the greenhouse and coldframes, seeds are propagated and nurtured until planting time. The compost piles, created from food waste and other natural materials, contribute nutrients which are essential to building healthy soil. Chemical-free plant care, and permaculture principles demonstrate practical techniques for a variety of visitors.